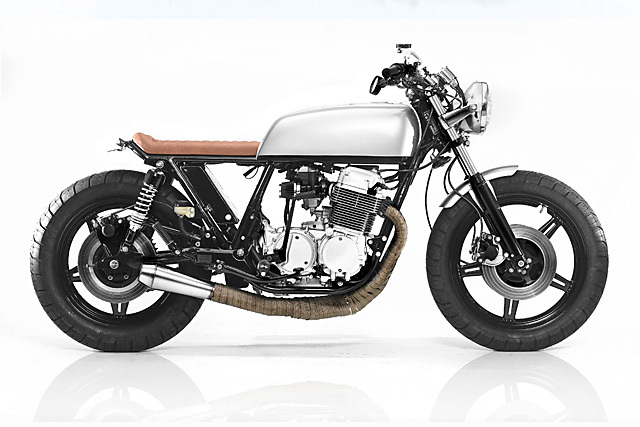 Steel Bent Customs started five years ago with owner Michael Mundy buying a bike that he wanted to build, customizing it and selling it off before channelling the funds into his next project. As the pace of his work started to quicken and he took on more bikes he soon he found himself head of a workshop with one of the more efficient work processes I’ve heard of recently. Customers place a deposit which holds them a spot on in the line to have their bike built. Once the bike is in the workshop and on the lift they’ll go over what the customer wants, pouring over photos and inspiration to help bring their dreams to life. This process allows them to keep bikes rolling through their shop at a pretty respectable pace. With builds taking around two months to complete Steel Bent Customs manage work their way through twelve to fifteen bikes a year. 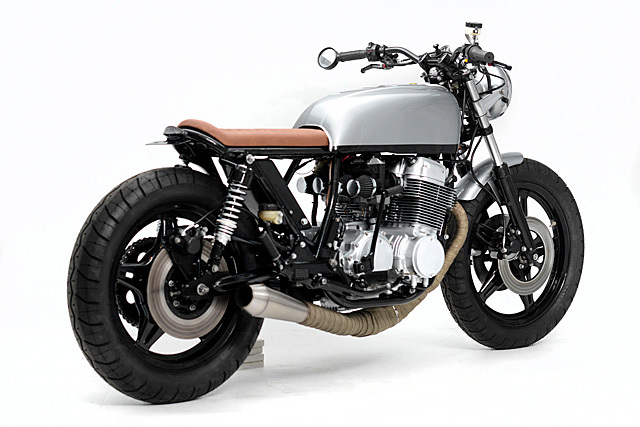 And that’s how this CB750 Super Sport came to life. It was in a condition typical of many old bikes, lying in parts in the owner’s garage as he waited for the time and space to be able to do the project justice. Instead of letting it lay dormant all the pieces were picked up and taken to Built City Customs who drew up a plan with the customer and went to work. Like most of the bikes that they build, Steel Bent Customs went around the frame removing all the unnecessary tabs and bracing, giving the frame a light and uncluttered appearance. The standard bulky rear end was cut and bent into a loop before it was sent to their local powder coat shop for some gloss black. 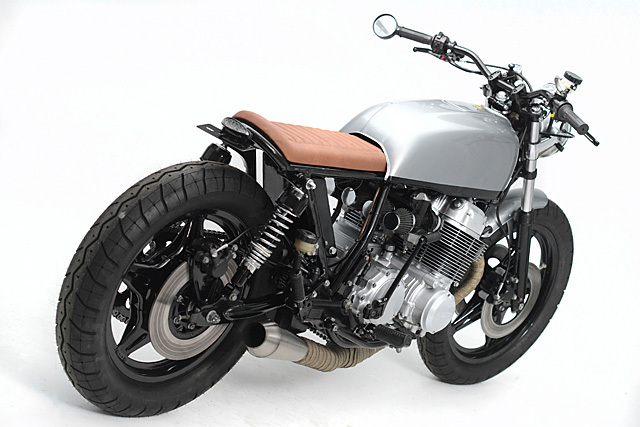 Their go-to shop, ProFab, had a bit of work with this CB750 with the engine cases, ComStar wheels, kick starter and an assortment of other parts getting freshened up. 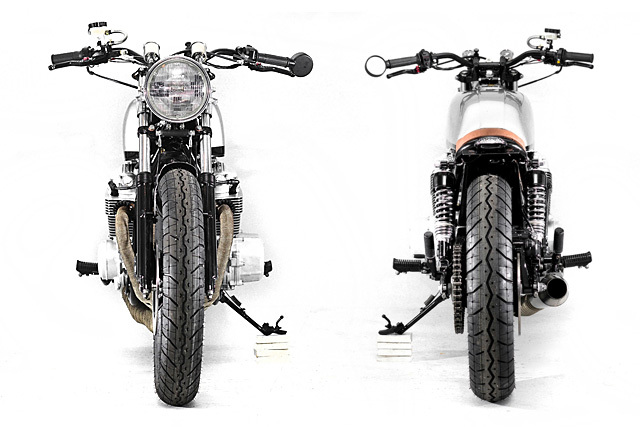 The paintwork on the headlight bucket, tank and front fender was painted by Florida man Craig at his aptly-named workshop ‘Craig Paints Bikes’, finished in a beautiful shade of light silver. And the way the tank has been finished is interesting too, with the wide strip of gloss black along the bottom helping it appear smaller and lighter than it really is. That’s a neat trick. 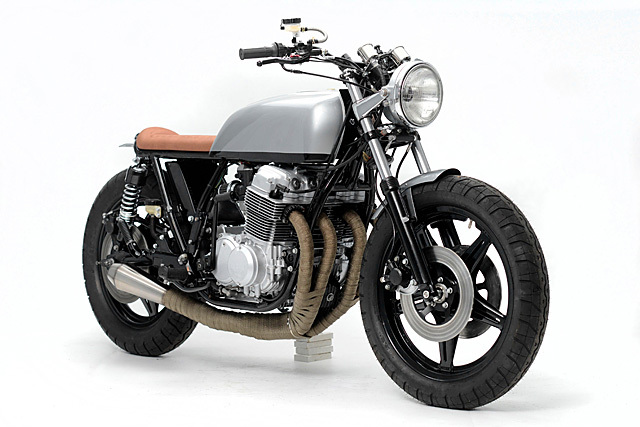 Finally the CB was fitted with a four into one exhaust system and the headers wrapped with titanium tape. 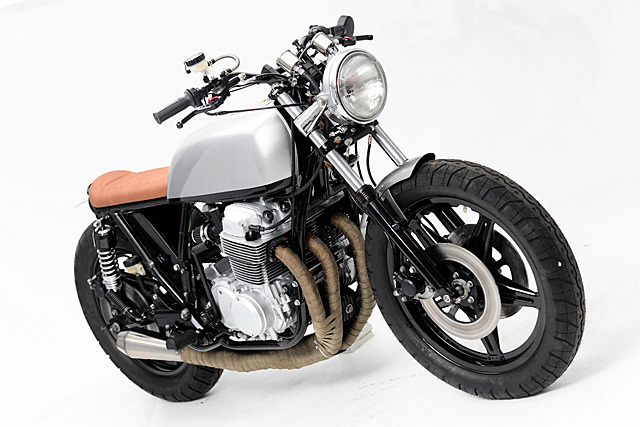 The seat was finished in-house and four new air filters were fitted to the freshened-up carburettors while a pair of Shinko 230 Tour Master tyres were mounted front and back. 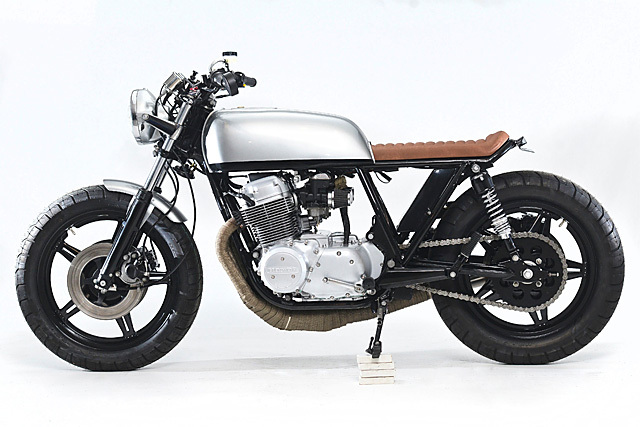 Smaller gauges were fitted up front and some long and low tracker-inspired bars help round out a clean CB750 SS that’s sure to make any Florida man proud, vacuum cleaner fluid affected or not.